Out of our five grandchildren, we only know for sure what one of them wants to be this Halloween. Our three year old granddaughter is definitely going as Sophia the First. She is obsessed with the show, and tells us all the time that when she gets bigger, she is going to be on TV, and she will be Sophia. She loves to sing, and she knows all of the words to most of the songs from the shows. We lucked out, and found a person selling the most beautiful formal gown that would be perfect for her costume, it was used, but in perfect condition, and at an amazingly cheap price! We also ordered her the talking toy amulet to wear. I am so excited to see how she looks, and to find out what our other four grandchildren want to be...it is truly the only thing I enjoy about Halloween, seeing our grandchildren and friend's and neighbor's children all dressed up, excited, and having a great time. MPM Network Bloggers are super excited to share their Halloween Recipes, Crafts, Decor Ideas and so much more with you this holiday season. Make sure you take a peek at the fabulous posts below. Surely you will find something that makes you smile! 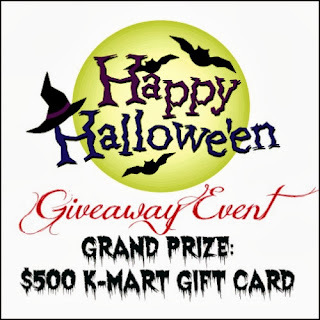 One lucky reader will receive a $500 K-Mart Gift Card! Giveaway ends October 28th at 11:59pm, open to US, ages 18+. To enter please use the Rafflecopter form below. Good luck. Disclosure:Cindi's World is not responsible for sponsor prize shipment. Please contact teri@mompoweredmedia.com with questions or to see your business or blog featured on the next big event!